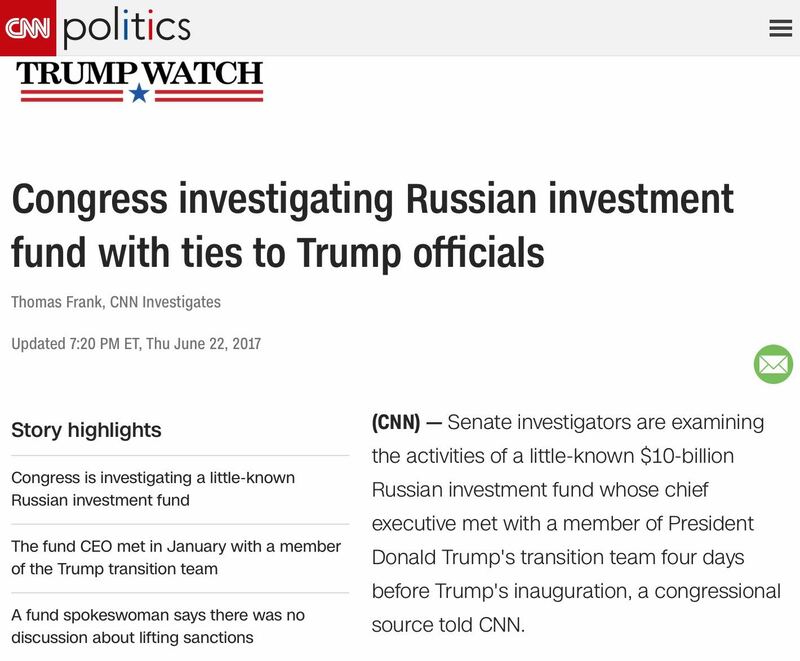 Thursday evening, CNN.com ran a story by reporter Thomas Frank which, according to a now-posted Editor's Note, connected "Anthony Scaramucci with (congressional) investigations into the Russian Direct Investment Fund." The Editor's Note tells the network's readers: "That story did not meet CNN's editorial standards and has been retracted." Further, "Links to the story have been disabled. CNN apologizes to Mr. Scaramucci." Then, in a Monday evening bombshell, Fox News's Howard Kurtz reported that "Three journalists (have) quit CNN in fallout from (the) retracted Russia story" — although it's possible they may have resigned instead of getting fired. The withdrawn story previously triggered a network editors' decision to consolidate their control over all future Russia-related stories, forcing such items to go through additional review before publication. CNNMoney executive editor Rich Barbieri sent out an email Saturday regarding the network's new rules after CNN a day earlier issued a retraction on one of its stories. "No one should publish any content involving Russia without coming to me and Jason [Farkas]," said the email, obtained by BuzzFeed News. "This applies to social, video, editorial, and MoneyStream. No exceptions," the email added. "I will lay out a workflow Monday." ... A source close to CNN told BuzzFeed the incident was a "massive, massive f--- up and people will be disciplined." Additionally, on Sunday, as Tim Graham at NewsBusters observed, CNN's Brian Stelter failed to address the withdrawn story on his Reliable Sources program. CNN apparently hasn't learned that Google often temporarily caches web pages. As of early Monday afternoon Eastern Time, cached copies of the network's story could still be found here (originally posted at CNN) and here (originally posted at a Florida TV station's website). The latter version is also saved here for future reference, fair use and discussion purposes. Separately, Steve Mnuchin, now Treasury Secretary, said in a January letter that he would look into the Jan. 16 meeting between the fund's chief executive and Anthony Scaramucci, a member of the transition team's executive committee and a fundraiser and adviser for Trump's presidential campaign. ... Scaramucci, the founder of SkyBridge Capital, minimized his January meeting with Dmitriev in the resort town of Davos, Switzerland, at the celebrated annual gathering of the World Economic Forum. Scaramucci had met Dmitriev at previous Davos meetings, although at the gathering in January, Scaramucci was expecting to be named White House liaison to the business community. Dmitriev "came over to say hello in a restaurant, and I was cordial," Scaramucci said in a recent email to CNN. "There is nothing there." ... A spokeswoman for the Russian fund said the two men did not discuss sanctions, and that the discussion itself did not violate sanctions that U.S. imposed in 2014 after Russia annexed part of neighboring Ukraine. The spokeswoman declined to describe the conversation, saying, "We do not comment on private meetings." Thus, what CNN's single anonymous "congressional source" claimed was a "meeting" was, according to those actually involved, a brief encounter in a restaurant. In response, Scaramucci tweeted the following late Thursday: "It's ok. I did nothing wrong. They like hitting friends of @potus who are loyal advocates on his behalf." Early Saturday morning, after CNN pulled the story, Scaramucci appeared to go out of his way to give the network a pass, tweeting that: "@CNN did the right thing. Classy move. Apology accepted. Everyone makes mistakes. Moving on." That leads us to the second obvious shortcoming in CNN's original story, which is that Frank acted as if he and the network had little or no previous familiarity with Scaramucci. While it's plausible to claim that the Russian Direct Investment Fund is "little-known," Scaramucci has been quite well-known to CNN — so well-known that he's been a frequent guest on the network's New Day and other programs, has written at least one op-ed posted on the network's website, and has also appeared on other cable networks' shows. A quick visit to YouTube surfaced tense but civil arguments between Scaramucci and New Day host Chris Cuomo on June 20, June 15, May 9, and March 22, as well as a June 9 appearance on Fox News's Hannity, a May 31 interview with that network's Martha MacCallum, and a June 9 MSNBC appearance. What's more, the Fox Business Network's Charles Gasparino reported on June 7 that Scaramucci is still being considered for some kind of advisory position within the Trump administration. This breathtaking omission about Scaramucci's visibility enabled Frank and CNN to completely avoid noting that he has been a visible and vocal supporter and defender of Trump. In other words, this anonymously sourced story has all the earmarks of a hit piece ordered up to discredit an articulate Trump supporter who may join the administration, perhaps by one of the two U.S. senators named later in the story, Democrats Elizabeth Warren of Massachusetts and Ben Cardin of Maryland. Now three of the CNN journalists involved in waving the story through — Frank; Lex Harris, executive editor of CNN’s investigative unit; and Eric Lichtblau, who edited the story — are no longer CNN journalists. Scaramucci's unusually generous tweet after the story was pulled, CNN editors' post-withdrawal reaction, and the now-reported resignations all indicate that there's much more behind how this story managed to get published than the network is willing to publicly admit.